4.02.1 A pleading or other documents written in French that may be filed under section 126 of the Courts of Justice Act may also include a version of all or part of the text written in English. 2. Subrule 14.10 (2) of the Regulation is amended by striking out “the sum of $100 for costs” and substituting “the sum of $400 for costs”. (b) what kinds of documents are likely to be relevant to the allegations made in the pleadings. 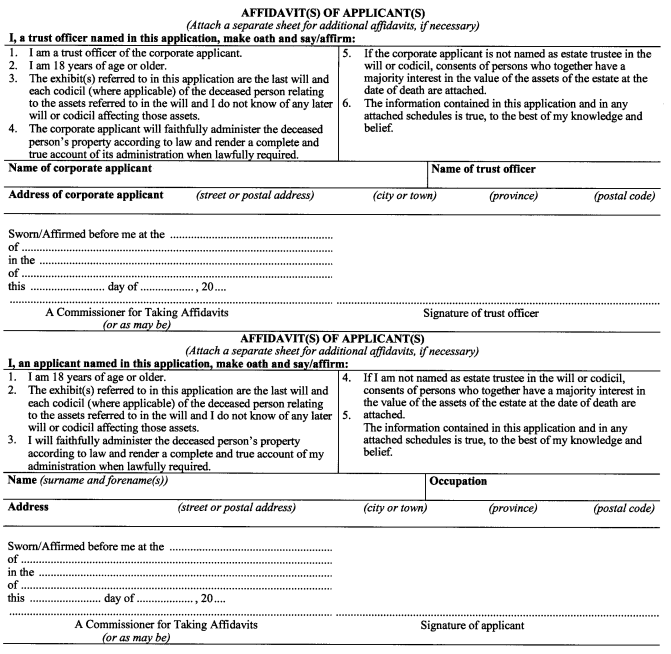 (c) a copy of the order dismissing the action or appeal as abandoned. 5. Subrule 61.09 (2) of the Regulation is amended by striking out “may move for an order” and substituting “may move before a judge of the appellate court for an order”. 6. 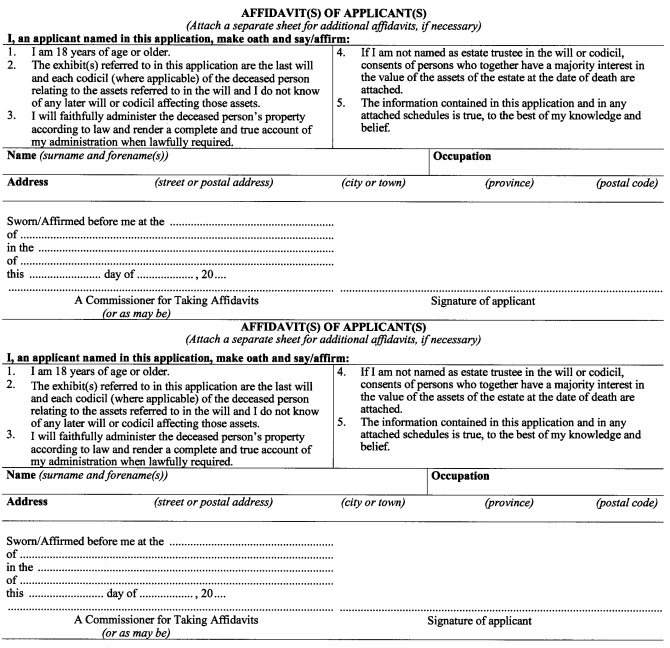 (1) Subrule 74.04 (1) of the Regulation is amended by striking out “(Form 74.4 or 74.5)” and substituting “(Form 74.4 or 74.5 or, if the application is for a certificate limited to assets referred to in the will, Form 74.4.1 or 74.5.1)”. 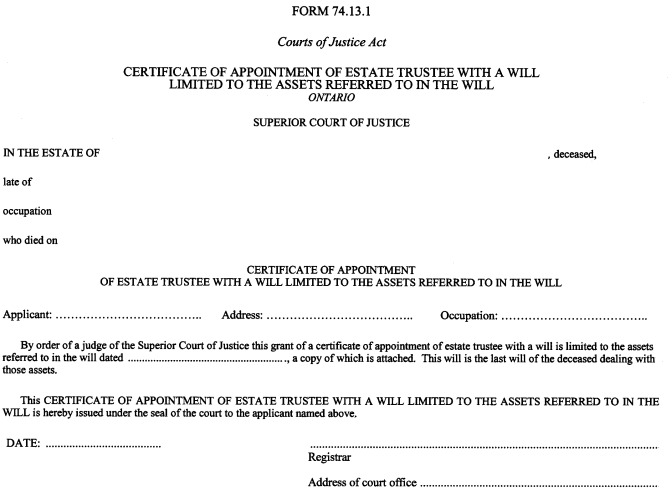 (9) The certificate of appointment of estate trustee with a will limited to the assets referred to in the will shall be in Form 74.13.1. (8) The dismissal of an action as abandoned has the same effect as a dismissal for delay under rule 24.05. (2) The dismissal of an action as abandoned has the same effect as a dismissal for delay under rule 24.05. 11. Form 4F of the Regulation is amended by striking out “Constitutional Law Branch, 7th floor” and substituting “Constitutional Law Branch, 8th floor”. 12. 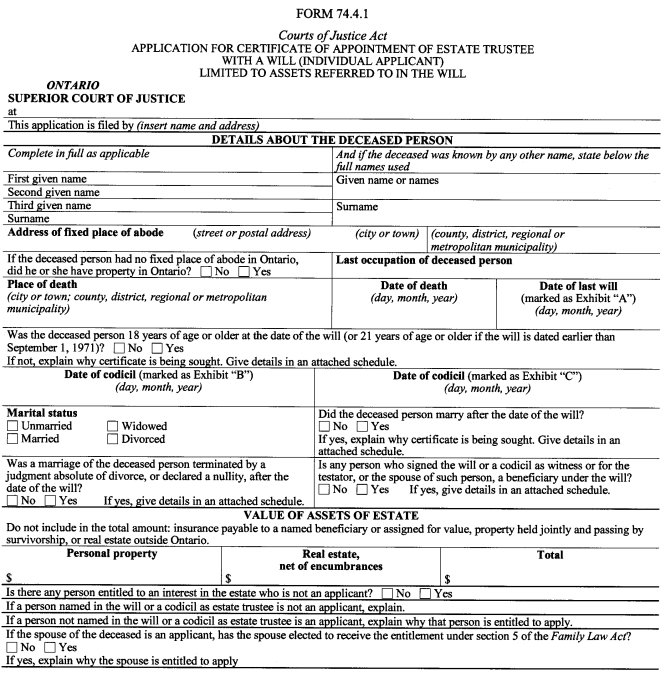 Form 14A of the Regulation is amended by striking out “If you believe the amount claimed for costs is excessive, you may pay the plaintiff’s claim and $100 for costs” and substituting “If you believe the amount claimed for costs is excessive, you may pay the plaintiff’s claim and $400 for costs”. 13. Form 14B of the Regulation is amended, by striking out “If you believe the amount claimed for costs is excessive, you may pay the plaintiff’s claim and $100 for costs” and substituting “If you believe the amount claimed for costs is excessive, you may pay the plaintiff’s claim and $400 for costs”. 14. 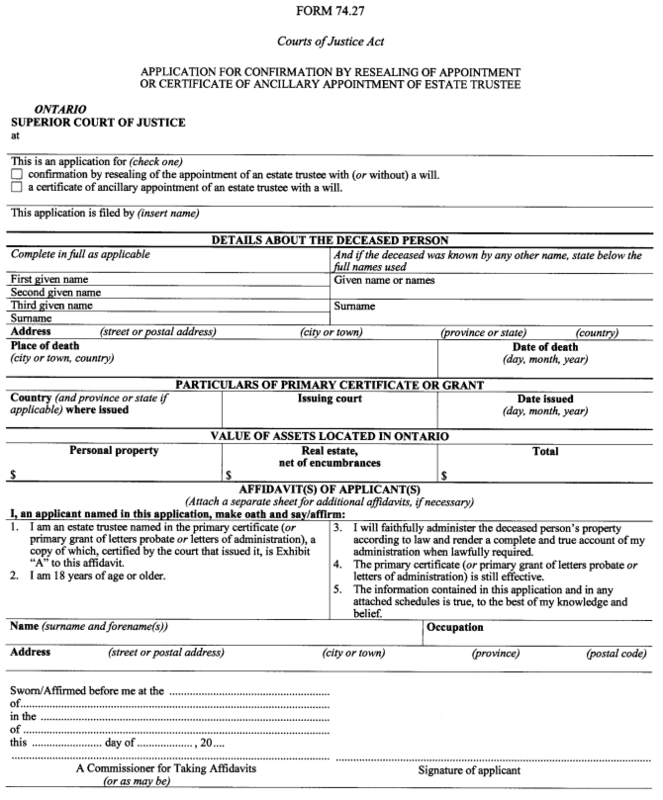 Form 14C of the Regulation is amended by striking out “If you believe the amount claimed for costs is excessive, you may pay the plaintiff’s claim and $100 for costs” and substituting “If you believe the amount claimed for costs is excessive, you may pay the plaintiff’s claim and $400 for costs”. 15. Form 27B of the Regulation is amended by striking out “If you believe the amount claimed for costs is excessive, you may pay the amount of the counterclaim and $100 for costs” and substituting “If you believe the amount claimed for costs is excessive, you may pay the amount of the counterclaim and $400 for costs”. 16. 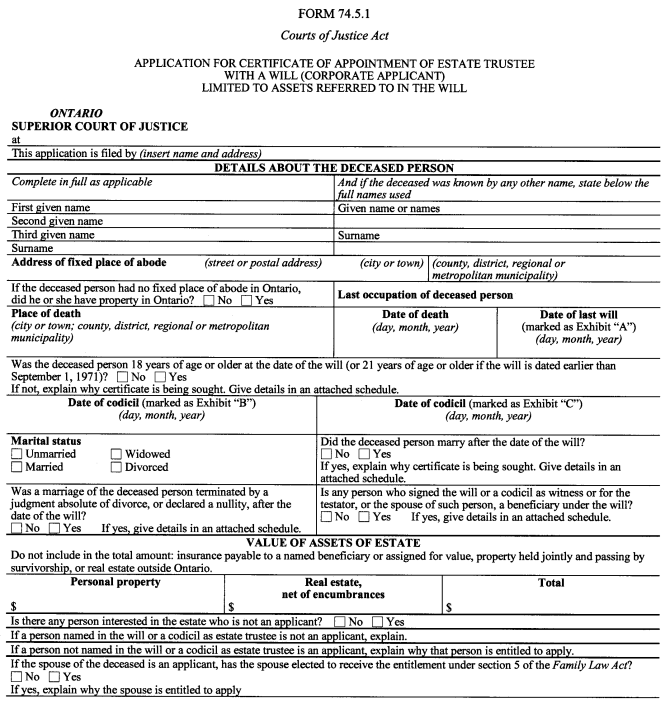 Form 29A of the Regulation is amended by striking out “If you believe the amount claimed for costs is excessive, you may pay the amount of the third party claim and $100 for costs” and substituting “If you believe the amount claimed for costs is excessive, you may pay the amount of the third party claim and $400 for costs”. 17. Form 74.3 of the Regulation is amended by striking out “I have a financial interest in the estate” and substituting “I have or appear to have a financial interest in the estate”. 21. Form 75.5 of the Regulation is amended by striking out “as soon as possible, but not later than 2 p.m. on the day before the hearing” and substituting “as soon as possible, but not later than two days before the hearing”. 22. This Regulation comes into force on March 1, 2001.